Here’s something to love about Facebook–you get to see a ton of funny images. Or things that inspire. Or awe. How cool is that! If I understand the Facebook credits properly, the genius behind it is Craig Hurle and that link will take you to the Dr. Who page. 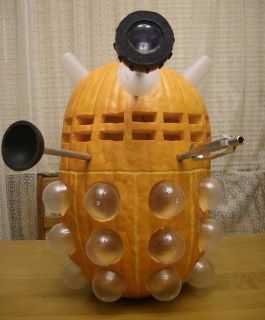 (There may be others but do THEY have pumpkin Daleks? Are they awesome?) Darn straight I “liked” the page! I will admit here that I, Liz Jasper, am a Dr. Who junkie. 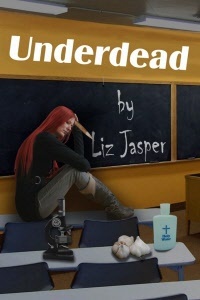 The new series, not the the older ones. My sister used to watch those paltry excuses for whodom when we were kids. Yes, she wore the striped scarf around like a dork (she’s my sister so, yeah, I’m calling her a dork). She had a big crush on the blond doctor. And probably the curly haired one with the big nose, too; she was that into it. I would take one look at the screen and roll my eyes and run out and shoot hoops. I was very, very condescending. And I still am. Hah! The new ones rule! Anyone with me? If not, Exterminate! 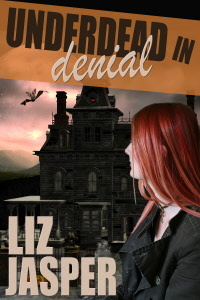 This entry was posted in Fun and tagged dalek, doctor who, halloween dalek, liz jasper, pumpkin dalek, tardis, underdead, underdead in denial. Bookmark the permalink. That pumpkin is in the wow-factor! My kids carve every year and usually the middle child in our clan has some elaborate idea. I tell him to ask Dad because I’m too busy with my wine. I know. My envy level is off the charts.